Posted on March 27, 2013 at 12:58. Our industrial touch screens use resistive touch sensors (discussed here), which are well suited for harsh industrial environments. The outer layer of these sensors is made of a polyester sheet that is coated with an acrylic “hard-coat” film for added scratch prevention. As a result, our touch screen sensors have a hard-wearing surface that is suitable for most environments. These are all situations we have seen in customer locations, and would prove a challenge for any touch screen technology. 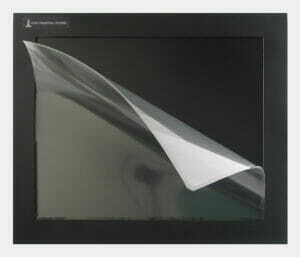 To allow our touch screens to be used in these environments, we offer our line of Industrial Monitor Screen Protectors. These screen protectors are made from a simple, 7-mil polyester with the same acrylic hard-coat that is used on the surface of our touch screens. A narrow strip of transparent adhesive that runs around the perimeter of the screen keeps the protector in place, while allowing it to be easily removed or replaced. These low-cost screen protectors are also available at a discounted “10-pack” price for customers who simply replace them from time to time as they become worn or dirty. While they are not for use in wet environments (liquids can get trapped between the protector and the screen), they allow our screens to provide years of reliable service in environments that would quickly destroy an unprotected industrial touch screen.